Well, we’re almost at the end of our Fresh Apple Series where I share various things I’ve been able to preserve using fresh apples in the peak of their season. And what a series it’s been! I’ve of course made Slow-Cooker Applesauce with many of the apples. I’ve even made and canned some of that applesauce into Cinnamon-Vanilla Flavored Applesauce. Plus I made and canned Apple Pie Filling for quick homemade pies. And of course one of RancherMan’s favorites too. I dehydrated some of those delicious apples into crispy Cinnamon/Sugar Apple Chips. But we’re not done yet, oh no! Those apples still have deliciousness to offer to our family. Today I’m sharing how I preserved my Homemade Apple Cider. While cooking my applesauce, the apples released much of their juice. But I’m not going to drain it off and dispose of it. When I saw all the juice that was remaining I couldn’t help but to think about the cooler weather to come. I want to save that juice and can apple cider to enjoy this winter! So as I was making my applesauce I strained the juice using a fine mesh strainer. The juice was stored in my refrigerator. When all my applesauce was done I pulled out that juice and strained it once again. Some people might like this final strain to be done using a coffee filter to get all the tiny particles of apple that are remaining. But I like the slightly thick consistency that these teeny-tiny bits offer. So I just strained it again using the fine mesh strainer and stopped when I got to the apple sediment at the bottom of my container. This was about perfect for me. I placed that strained juice in my stock pot and turned on the heat to medium to begin heating it up. In the meantime I pulled out my canning jars and washed them up. I filled them with water and placed them in my water-bath canner. Of course the canner was also filled with water to the top of the jars. Then I placed the whole shebangie on the stove to heat. By heating these clean jars for a bit I’ve sanitized my jars in preparation for canning. Plus by filling hot jars with hot liquid you have less chance for breakage than if your jars were not hot. I also brought out my canning jar lids. Some were standard lids but some were my *Tattler reusable lids because I love that they can be reused over & over again. I typically use about half traditional & half Tattlers when I’m canning so I get the pleasure of hearing that “PING” with the traditional lids while still utilizing the reusable Tattlers. Plus since I don’t want my Tattlers leaving the house. So using some traditional lids when I’m canning assures that I have some of these jars of cider available to give out with our homemade Christmas Gifts if we like. Anyway, I prep the lids by first boiling some water in a small pan. Then I remove the pan from the heat and drop the lids into the hot water to soften the rubber. You don’t want to boil them – just get them nice & hot. I cover the pot to keep everything good & hot until I need them. By now my apple cider is boiling and my jars have been sanitized. Finally I’m ready to start canning. In this case the canning is easy-peasy! I just ladle in my hot apple cider into my hot jars leaving only 1/4″ head space. Then I wipe the rims of the jar with a damp rag to assure no apple bits or juice are between the jar and the lids to keep them from sealing properly. Finally I attach the canning lids and return the filled jars to the water-bath canner. The next morning I removed the rings and tested for proper seals. The traditional lids will be slightly sunken in at the middle and will make no plinky-noise when pressed. The Tattlers will remain tight when light pressure is used as if you were trying to gently remove the lids. Hooray – all sealed! Now all that’s left to do is wash down my jars, label them with contents and date. I store them all in my pantry. During those raw winter months I love to sit on the couch snuggling with my handsome RancherMan under a blanket. A blazing fire in the fireplace and a steaming cup of spiced apple cider stirred with a cinnamon stick to warm me from the inside out. C’mon by & sit a spell! Come hang out at our Facebook Page. It’s like sitting in a front porch rocker with a glass of cold iced tea – lots of good folks sharing! You can also follow along on Pinterest, Twitter or GooglePlus. This entry was posted in Blog Posts and tagged Cooking, Environment, Fall, Food Preservation, Frugality, Gardening, Holidays, Make-It-Yourself, Winter on September 26, 2015 by Texas Homesteader. I see this is a fairly old thread, but am wondering what exactly you are using to make this. Is it the water/juice mixture that is from boiling the apples to soften them to make the apple sauce? I like to cook a lot of things myself, but my favorite part of cooking is sharing with everyone else. I’d like to send some of this cider to my relatives for Thanksgiving, but I’ve never shipped canned goods before. Any recommendations on transportation/packaging? Yes, I have shipped canned good to one neighboring state. It was not a successful experience. The seals broke and the recipient received canned goods with mold already starting to form at the top. I sent 12 jars….none of them were successful. Yes, they still had the bands attached when shipping….keeping the seal is a problem. I will never waste food like that again. I have shipped canned goods, many, many times. I tie each jar individually in a plastic grocery bag (just in case it does break). Then I uses news paper or bubble wrap (whatever I have at the time). I always pad the bottom with what I’m using, then pad between each jar and the sides, and lastly between the jars and the top of the box. In all the years of sending things I have only had one jar break. You just need to pad it really well and I haven’t had a problem with the seals either. They’ve gone from Texas and Georgia to Milwaukee, Tacoma, Woodinville (suburb of Seattle), and Boise. But the padding is what can make or break (litterally) the jars. Sounds so easy! Thanks for sharing on the What’s for Dinner link up! Hi! I had a question about the spiced part of apple cider. Do you add those when you heat the cider? How long will this keep in the pantry? This is amazing and sounds so delicious! Now, I need some apples to make some!! Hopping over from the homestead blog hop. Pinned so I can remember this. Thanks for sharing! Gasp, I need to do this! We drink so much apple cider so this would be great. Looks Yummy! Thanks for Sharing On My 2 favorite Things on Thursday, Hope to see you again this week!! Pinned! What a great idea! This is really close to orchard cider making where whole apples are squashed in a big press so that all the juice is pressed out. Until I have the money (and space) to get a cider press of my own, this will certainly do! Thanks. Jodi, I’m not gonna lie – it’s DELICIOUS! And in my earlier years it would have just been drained off and wasted. This is fantastic! Can’t wait to try it. Thanks so much for sharing! Works great Melissa and I have my own homemade comforting winter beverage waiting in the pantry for the cold weather to hit. 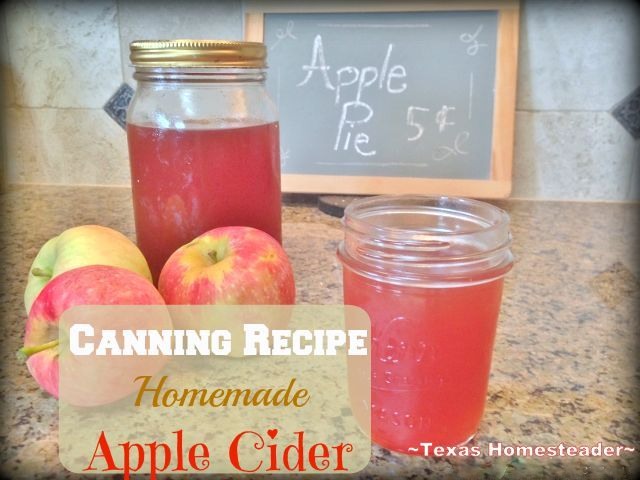 I”ve never made apple cider or canned but this looks fun. 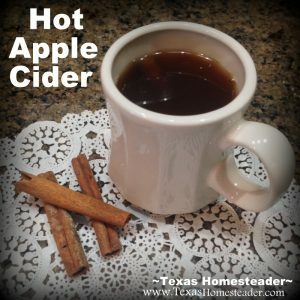 what a great idea….A cup of hot cider by the fire during a snowstorm sounds good to me, I will be apple picking next week and will try this! Oh yeah, it’s apple season Patti and I love being able to use ALL of the apple. I’m going to once again attempt to make apple cider vinegar with the peels and cores, we’ll see if I can be successful this time. This is such a smart idea! I love apple cider and I can’t believe I’ve never thought to do this. Thanks for sharing! I almost can’t wait for cold weather to hit Marie so I can enjoy this cider steaming hot to warm me from the inside out. Delicious!